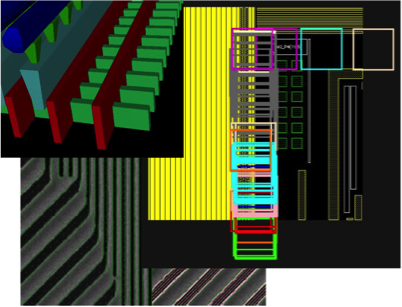 Today’s semiconductor industry faces the dynamic nature in either SOC or SIP path-finding and diversity of applications in IoT, automotive, mobile, high performance computing and even heterogeneous components integration. 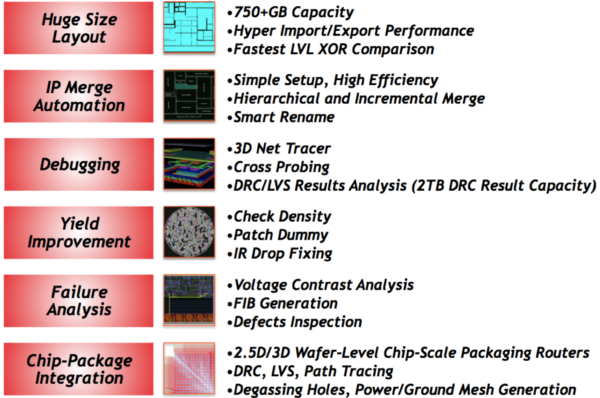 For example, a top-level layout assembly task normally manages hundreds of sub-blocks in either a SOC GPU chip, or an advanced-node testchip design, or a multi-chip SIP project; while each sub-block owner may have many design re-spins.High performance layout integration platform is highly desired to embrace the common challenges in chip-scale, wafer-/panel-level layout integration of complicated design intents, post ECO &dummy engineering, revisions and huge data size and/or with multiple database formats. 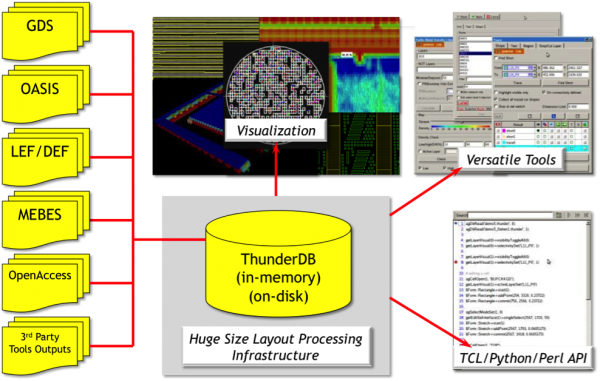 THUNDER is a versatilelayout integration platform to support heavy layout handling efforts from post P&R, IP merge automation &management, physical ECO verification (XOR LVL, connectivity, etc), DRC/LVS debugging interface, and even (in-line inspection) defect-to-layout mapping , failure analysis and chip-package integration (interposer vs. InFO RDL-routing, pins connectivity, etc). ThunderDB is its proprietary database, and is efficient to handle huge layout data with extreme performance of up to 600+GB GDS equivalent per minute. 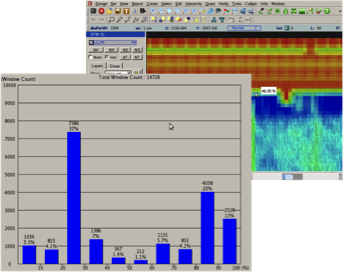 Users can then perform big data analysis for further processing (e.g. 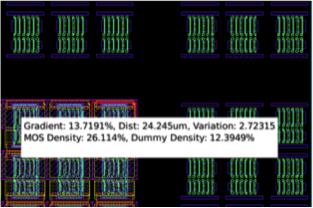 3D-view, cross-section, density mapping, wafer map), machine-learning based optimization, and manipulating data from GDS, OASIS, LEF/DEF, MEBES, OpenAccess and 3rdparty tools output. THUNDER provides system integration for IP from GDS/LEF/DEF files with great flexibility such as standard cell replacement, don’t-change list, etc. 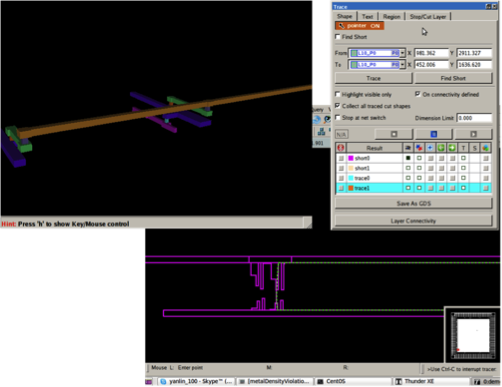 It performs layout comparison during renaming, which eliminates unnecessary renaming. It supports hierarchical IP merge with incremental change. 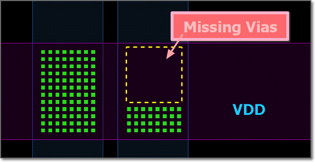 It generates a summary of missing cells, renamed cells, identical cells, and cross-reference. THUNDER provides intuitive multiple-Boolean expression to generate shapes on original design directly. THUNDER enables user tobrowse/edit several hundred gigabytes of GDS/OASIS. The intuitive GUI is as friendly as popular layout editors. 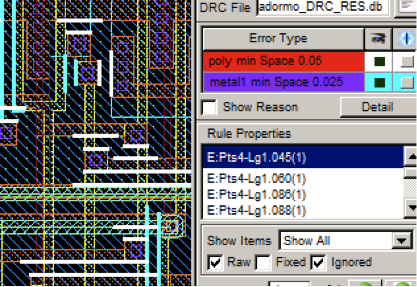 It provides advanced layout editing features, such as Smart Flatten and snapping to DRC marker, ideal for DRC bug fix. Copyright © AnaGlobe Technology, Inc. All rights reserved.